Seat Covers for the Jeep Liberty are custom tailored for a perfect fit and do not block seat controls. Comfortable yet durable fabric matches your vehicles interior color while protecting original upholstery from dirt and tears. Easily removable for washing and feature vehicle logo. Black Wet Suit-like material, full front and rear set, with Jeep logo. Available in High-back seat or Low-back seat (with separate headrest, as pictured.) Please select model year and type above. Item # 82209323 - High-back seat (2005-2007 Sport & Renegade) - Installation Guide Cancelled by Mopar. Item # 82206014 - Low-back seat (2002-2004 Limited & Renegade) Cancelled by Mopar. 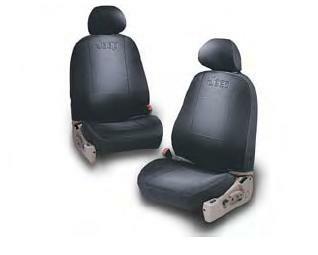 Item # 82206863 - High-back seat (2002-2004 Sport) Cancelled by Mopar. not worth the cost, not full seat covers. I was pleased with the material upon initial viewing and started to appreciate the fit and tightness when I was installing the first piece which was the headrest covers. Thats when my enthusiam ended. The rest of the covers are very difficult to stretch for installation for some parts while others are very sloppy and look like I just installed some garbage from wal-mart. These are not like the traditional covers that Ive installed in other vehicles where the entire seat was covered but more like cover protectors since the backs are open and the seat bolsters are exposed along the back sides of the seating area. What's the point of advertising that the covers are made of wet-suite material (giving the impression they will allow some off road dirt and water protection) if the bottoms are open allowing any water to just pool up on the back end where the factory seats are exposed?